Be the first to share your favorite memory, photo or story of Mother Idella. This memorial page is dedicated for family, friends and future generations to celebrate the life of their loved one. 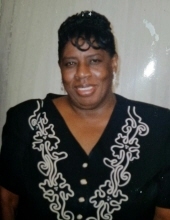 Mother Idella T. Hill of Gainesville, FL quietly passed away November 16, 2018. Born in Margaretta, FL she graduated from Keller High School and Santa Fe Community College. She accepted Christ at an early age and married the late Elder James Hill, Sr. They served the Westside COGIC, Alachua, FL as Pastor & First Lady for 42 years. Mother Hill was a dedicated Sunday School Teacher, member of the Gainesville District Hospitality Committee and a retired teacher's aide at Duval Elementary. She leaves behind her children, James Hill, Jr. (Shannon), Lawrence Hill, Janice Hill-Early (Scottie); four grandchildren, Jamie Hill, Danielle Hill, Yasmin White, Taylor Hill-Miles; great grandchildren, Jordan Elliott, Laila Hightower, Aubrey Stokes; seven sisters, Gladys Symonette, Barbara Prior (Pastor Henry), Polly McKay (Henry), Grace Givens, Susan Belford, Gail Haygood, Carol Jefferson; a brother, Otis Thompson; Her Westside COGIC Family, other relatives and friends. A Celebration of Life Service will be held 1:00 pm Saturday, November 24, 2018 at Williams Temple COGIC, Elder Kenyarda Feathers Sr., is Pastor, Pastor Videll Williams, Presiding, Supt. Lowell T. James is Eulogist. Burial will be in Forest Meadows Cemetery - East. Viewing on Friday 3 pm - 7 pm at Pinkney-Smith Funeral Home 727 NW 2 St., Gainesville, FL and Saturday at the church 12 pm - 1 pm. No viewing after eulogy. Family will meet at the church 12:45 pm. PINKNEY-SMITH FUNERAL HOME OF GAINESVILLE. To send flowers or a remembrance gift to the family of Mother Idella Thompson Hill, please visit our Tribute Store. "Email Address" would like to share the life celebration of Mother Idella Thompson Hill. Click on the "link" to go to share a favorite memory or leave a condolence message for the family.